Since 2012, TIMA has produced an annual cultural guide to the greater U.S./Canada Passamaquoddy Bay region including communities in both Maine and New Brunswick. 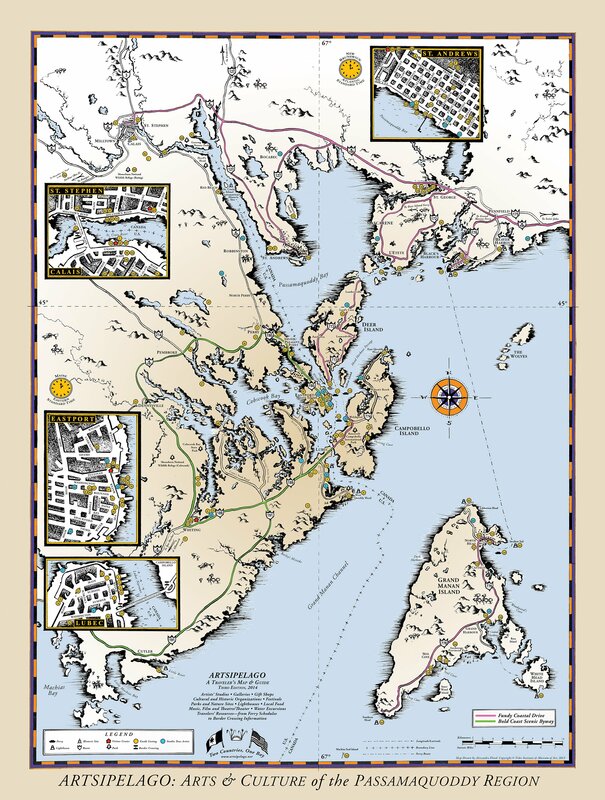 Called Artsipelago, referring to the numerous islands and extended peninsulas in Passamaquoddy Bay, the guide includes an annual printed booklet with artist created and illustrated map of the region (see below) and an online searchable directory to artists, galleries, farmer’s markets, museums, art centers, ferries, lighthouses, and more. The online Artsipelago includes a weekly posting of cultural events taking place during the year throughout the region. To subscribe to the weekly posting of cultural events, follow this link: Subscribe. In addition, Artsipelago includes an annual summer studio tour of artists working in Maine and New Brunswick.